Specialty Glass products are made from recycled bottles, plate glass, and stained glass. This is done with custom made equipment that they have spent the past several years developing. 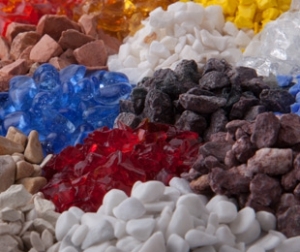 Glass recycling process produces cleaned and dried glass chips that are mostly rounded or cubic in shape. Chips are sorted into the five standard terrazzo sizes, plus fines for background color and texture. Also offers a fine white sand, made from plate glass, that is excellent as a substitute for silica sand. Stained glass chips are made from glass that is 1/8″ thick, therefore sizes larger than #1 tend to be somewhat flat. Plate glass is somewhat flat in sizes larger than #1. Thick plate glass is more expensive, but is generally rounded in sizes up to #3 or #4. Most colors are in stock and available for immediate shipping. Some non-stock colors may require a large minimum order and up to 30 days lead-time. Expect a very small amount of color contamination in stained glass. In plate glass expect some color contamination from tinted plate glass, usually gray. In pre-consumer bottle glass their is almost no contamination, because the bottles are new bottles with no labels or caps. Post consumer bottles have considerable color and label contamination.